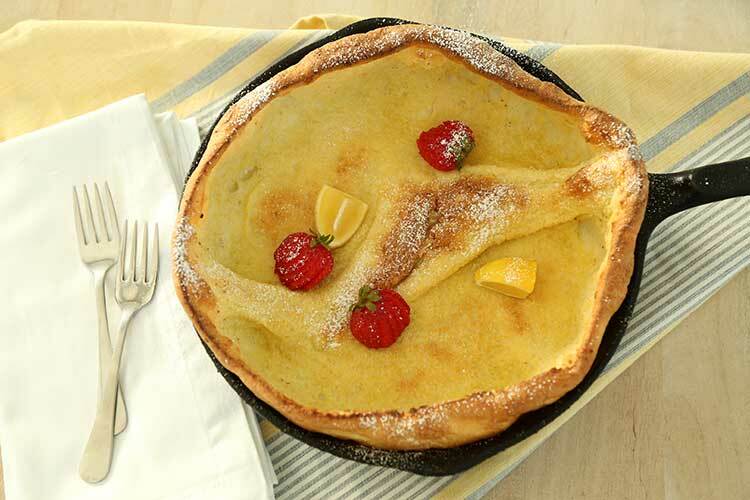 I do not think there is anything truly Dutch about a Dutch baby pancake, but it is similar to the German pfannkuchen. Basically it’s a giant popover, baked in a skillet, with eggs being the only leavening. 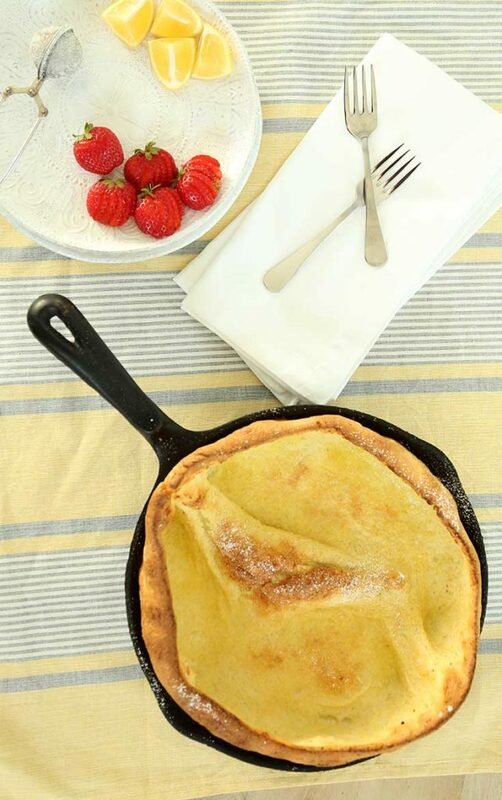 When done correctly, a Dutch baby is a marvelous sight to behold (and a marvelous thing to eat). It puffs up dramatically and creates craggy, crispy edges and hollows filled with melted butter. It reminds me of a caldera, if volcanoes were edible. The key to a properly made Dutch baby is having all ingredients at room temperature! It cannot be over-stressed. Allow your eggs and milk to sit out on the counter for an hour before making the batter. Cold eggs do not rise nearly as well as not-cold eggs. If you forget, you can still make it but it won’t be nearly as beautiful or puffy. 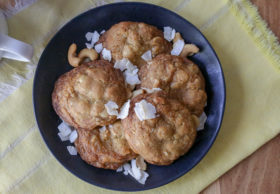 You might also like these piña colada pancakes! Whisk together milk, egg, zest, salt until smooth. Whisk in flour until smooth. Melt butter in a 9-10 inch oven-proof skillet over medium heat. Once melted and hot, pour in the batter. Bake 20 minutes. Do not open the oven. When cooked, it will be very puffy and the edges a dark, golden brown. Serve at once before it deflates. It’s fun to tear off chunks but you can cut it like a pie if you must have manners. I wonder if I can get this cooked in the morning before my kid gets on the school bus? Perhaps leave egg & milk out overnight? This would be a nice change up for breakfast. Usually I stick to eggs or grilled cheese. Hey Momma J! I wouldn’t leave the milk out overnight but the eggs should be fine. Could micro the milk for a few seconds in the morning to get the chill off. I’ll try it tomorrow, and measure the dry stuff into my shaker to mix it. I appreciate the tips. It’s a challenge to get my youngest out the door with something nutritious for breakfast. Lately, she’s been happy with a grilled cheese sandwich. Thankfully, we have a very sweet school bus driver who allows the kids to eat, as long as they don’t leave a mess behind! I’ve made dutch baby on the spur of the moment and I put the eggs into a bowl of really hot water and changed the water as soon as it cools the first time, until the eggs no longer felt cool when I held them in my hand. It worked pretty well, if you have half an hour you can definitely make this in the morning for a special breakfast. Oh that is a great tip, Peggy! 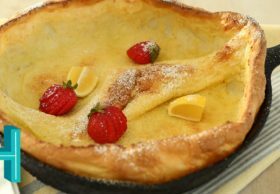 You probably know that Dutch baby without the lemon zest is identical to Yorkshire pudding. And if you bake some cooked sausages into it you have toad-in-the-hole. My British cookbooks give their toad-in-a-hole recipes under “Pub Grub” or “High Tea” rather than breakfast. I got a few comments on YT saying that this is basically a Yorkshire pudding. I’ve never had one, only read about them. They are typically made with meat drippings from a roast, right? Either suet or butter, I want to try one with sausages in it! My understanding is that Yorkshire pudding is made exactly the way you make Dutch baby, minus the lemon. The fat that coats the skillet can be butter, beef drippings (per Nigella Lawson) or even vegetable oil (per Jamie Oliver). If you make toad-in-the-hole in the same skillet in which you browned the sausages, you may not need to add any grease to what renders out of the sausages. Jamie Oliver serves toad-in-the-hole with an onion and apple gravy, based on beef stock. Yorkshire pudding is like a popover – yummy! I love toad in the hole, with gravy of course! As for the similarity to Yorkshire pudding, there is a major difference in procedure: oil is added to the pan or molds which are then placed in the oven until the oil is hot, only then is the batter is added. (Apple’s magic track pad is magic alright. Evil magic! All I have to is look at the “Post Comment” and it makes with the click business). 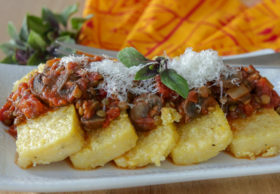 Have you tried making this with an egg substitute like flax seeds or chia seeds? 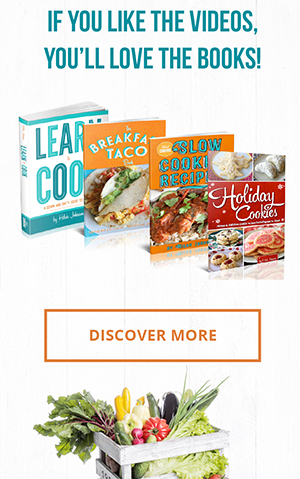 I don’t have an egg allergy like Flint, but I’m really eager to learn more about vegan baking. I don’t think that vegan egg replacement would work for this recipe, since the eggs’ purpose is leavening rather than sticky-togetherness. 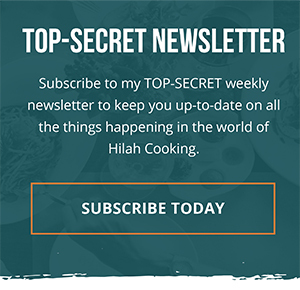 I think if you tried it, you would definitely want to add a half teaspoon of baking powder to the mix, but even then it probably wouldn’t get quite as puffed. what about replacing the egg with baking powder and a tablespoon of vinegar? That is what I use for leavening in cakes. It would definitely make it rise, but I think you’d end up with a giant pancake, not the bubbly popover-like texture. Eggs are also a big part of the flavor. 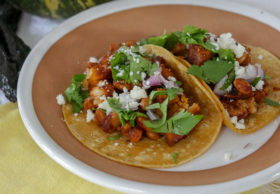 Made this recipe early thismorning, it turned out very good! Thank you for sharing it! 🙂 also hello from PA! Wonderful! Thanks for sharing your picture on IG! I’m Dutch, have been for 50 years, but never saw, let alone have eaten a Baby Dutch. It looks absolute delicious so who cares about the historical significance of the name, right?